How would you like to undertake an intense course of guaranteed Irish offshore racing training? 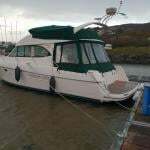 Start as an absolute beginner on a strange boat in April next year. Dedicate yourself to it. Then by the end of June, the boat – aboard which you’re now very much an active and involved part of the sailing team – will have won a podium place in her class in the Round Ireland Race 2016. Or even further into the realms of fantasy, how about starting your offshore sailing learning experience at a similar early season time in 2017, but aimed at the Fastnet Race? Or perhaps you’ll be continuing to build on 2016’s experience and successes. Either way, by the evening of Friday August 18th 2017 you and your shipmates are in the prize ceremony throng at Plymouth. And you’re absolutely bedazzled by the fact that you’ve won your class in the Rolex Fastnet Race 2017. Sounds good…? W M Nixon takes up the story. When something sounds too good to be true, it usually is. And the scenario outlined above was still very much in the realms of fantasy eighteen months ago. Yet at Easter 2014, Irish Offshore Sailing started a course of intensive training for beginners aboard their two Jeanneau Sunfast 37s towards competition in the Round Ireland Race 2014 in June. And by the end of it, the better-placed of their two boats was very much in the frame. Then for this year, they spread their wings still further, and once again started early in the season with the makings of a crew many of whom were complete beginners, but all were highly motivated towards doing the Fastnet Race, and doing well in it. They not only saw it through to the end, they were brilliantly successful and have a mighty trophy to prove it. In theory, Irish sailors aiming for this scenario have it made. 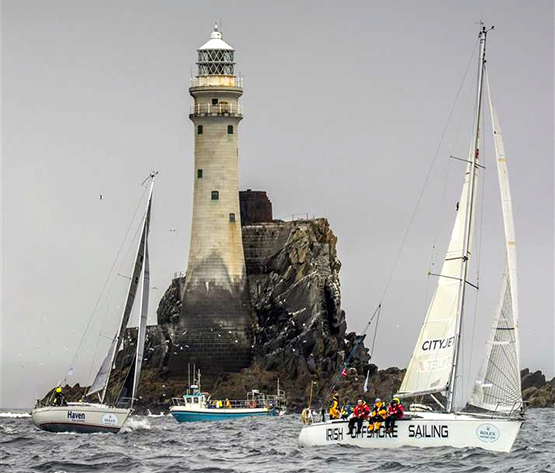 They have the advantage of the Dun Laoghaire to Dingle Race in late June as a convenient Fastnet Race qualifier. So to say that this trainee crew’s programme was “time-efficient” is under-stating it. The Dun Laoghaire-Dingle takes a long weekend, other intensive training could be put in at night and at weekends, and the Rolex Fastnet Race is done and dusted in a week. So it’s about eight days off in all, nine at most. Thus for any crewmember who wished or could, there was still time and entitlement available for those in jobs to take an ordinary holiday before the bubbles had fully settled. Yet although our wannabe Round Irelanders and Fastneteers may have this wonderful training ground and courses of international repute right on their doorstep, getting involved from scratch has not always been easy. Sister-ships. The Irish Offshore Sailing School duo make their debut in the Round Ireland race 2014. The enduring strength of the club structure in Ireland means that learning to sail here is not necessarily a straightforward process. A child from a club-oriented sailing family will be reassuringly guided into the club-administered ISA training programme. But while there is an increasing effort to provide club courses which are also attractive to adult beginners, the reality is that as the age increases and the complexity of the sailing being undertaken develops, the options for outsiders become increasingly limited unless they can attach themselves as crew on a boat already in the club system. In the south of England, where there’s a large and affluent population providing a ready market, the situation is very different. Commercial sailing schools play a key role in meeting basic demand, and most such schools do reasonably well. But in the more specialised world of schools providing boats and sailing courses which take crews offshore and right up to the top grades of qualification with events like the Rolex Fastnet Race as the ultimate objective, a thriving industry-within-an-industry has developed. Former pupils stay with their offshore schools for extended periods - in effect in permanent post-grad mode - as their offshore sailing schools, having provided them with training, now also provide them with a ready-made camaraderie, an instant virtual club environment. Desert Star was also second overall of all the Irish entries in the Fastnet, so her skipper Ronan O Siochru was most deservedly the Afloat.ie Sailor of the Month (Offshore) for August. Those who know Ronan O’Siochru and what he does will have known just how thoroughly this recognition – and the Fastnet Race trophy – was earned. But although the rest of the sailing community in the greater Dublin Bay area will be aware of the activities of the two Irish Offshore Sailing sister-ships as they go about their training programme – often at anti-social hours of the night, and often in adverse weather – the achievements of Ronan O’Siochru and his team should be a banner of hope for all Irish sailing. Ronan O’Siochru (32) is from Cork, but he’s from a non-sailing family in Bishopstown. However, one of the keys to his current success in his chosen area of sailing is that he’s from a long line of teachers. At least three generations of them, teaching away. But somehow he got the boat and sailing bug in Kinsale before he was even into his teens. When asked how he got himself to Kinsale from Bishopstown to pursue this developing passion, he admits there were times when it could be a very long hitch-hike for a little boy in the rain. Yet gradually he built up contacts in Kinsale sailing, and his ready enthusiasm to learn and to crew soon saw him often afloat in an increasing variety of boats. The urge to own his own boat became a priority, and he set himself at it with typical dedication, working in a vegetable shop at £3 an hour (this was in pre-Euro days) until he’d the £600 to buy a Flying Fifteen of a certain age. For most young Irish sailors, that would have been the beginning of a lifelong interest of boat ownership with self-maintained craft sailed within a local club context. But the young O’Siochru had visions of greater things. He realized that having an internationally-recognised Yachtmaster (Offshore) Certificate was a passport to interesting sailing jobs worldwide, so he set himself on this course and in time found himself within the orbit of the legendary Bob Salmon, veteran of more than fifty Transatlantic Crossings, and a proponent of mini-Transat racing. When the young O Siochru – now 21 – asked Salmon what would be the best way forward to a Mini Transat Campaign, the suggestion was he should buy a little boat and sail her to Iceland single-handed as a charity fund-raiser for starters, and then they’d see what could be built on that. The result was the smallest 21-footer you’ve ever seen caught out in a vicious Atlantic storm west of the Outer Hebrides, and a young Corkman getting to know the crew of the Barra lifeboat very well indeed, but for all the wrong reasons. So it was back to the grindstone of working away as a Yachtmaster and a Yachtmaster Instructor in whatever positions became available. With his strong inheritance of the teaching gene, his proven ability to recover from setbacks, and his precious gift of being able to convey a love of sailing for its own sake to those he was teaching, Ronan O Siochru was leading a very busy and fulfilling existence, but “peripatetic and undomesticated” would only begin to describe his way of life. However, during his ventures under sail he met a girl in Gibraltar, and it was time to change tack. She was from Birmingham, she was called Salome (she really was and is), they got married, and the move towards having his own boats in his own sailing school in Ireland became a priority. 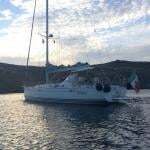 He’d been diligently saving everything he could from instructing and yachtmastering, so when in the winter of 2009-2010 he heard that Port Solent were selling off a raft of 2002-built Jeanneau Sunfast 37s, they bought one as the basis of a fleet, and Ronan and Salome sailed the new boat home to Ireland in January 2010. It was a crazy time to be starting any sort of business with the recession gripping Ireland, but the reckoning was that if they could survive the bad times then they’d thrive in the good. Not that anything was easy. Ireland’s Department of the Marine makes it very difficult to get a boat certified – it can cost around €25,000 per boat in extra equipment to achieve this – while the Irish Sailing Association is so club-oriented that the new Irish Offshore Sailing School found it much more satisfactory to deal with the RYA for guidance. They set up shop in Dun Laoghaire Marina, for much as Ronan’s first love is sailing the Cork coast, he’d no doubt that the relative size and concentration of the population of Dublin, with its high proportion of affluent and energetic young professionals, made a Dublin Bay location essential for such a tightly-focused business. Now that success has been achieved, it all looks like a smooth progression, but heaven knows there were times it was anything but. However, the sheer enthusiasm of Ronan O Siochru and his crews began to interest other sailors in Dun Laoghaire Marina, and top skipper Peter Beamish, recently retired from an international career in management in American conglomerates, was interested both with a view to acquiring a few certificates himself, and also maybe in becoming an instructor too. He is now part of the team, and finds his extensive business management experience has additionally brought him aboard as mentor and financial advisor. Somehow they not only hung in, they expanded, and when the demise of Glenans Ireland made a Baltimore-based Sunfast 37 called Sherkin available for sale, they added this sister-ship to their lineup, and the sunny start to the Round Ireland Race 2014 with the two IOS boats setting off with the rest of the fleet underlined the fact that here indeed was a very significant new force to be reckoned with in Irish sailing. It has been onwards and upwards ever since. The crew for the Fastnet campaign with Desert Star from April through to late August reflected both the way in which Dublin has drawn in young professionals from near and far, and also the fact that Ronan O Siochru and his school were already receiving marked respect for what they do even before the Fastnet win set them in lights. Finally clear of the crowd in the Solent – Desert Star settling down nicely with the Needles at the west point of the Isle of Wight astern, and room ahead to work the bays out of the worst of the tide. Thus people from elsewhere were and are prepared to commit to travel to Dun Laoghaire for each part of the programme afloat, the final lineup when the Fastnet Race started on August 16th being Ronan O Siochru (Cork) skipper, Kristian Aderman (Sweden) first mate, Dr Rupert Barry (Dublin), Symeon Charalabides (ex-Greece, living Dublin), Dave Garforth (ex-UK, living Cork), Louise Gray (Monaghan, living Dublin), Dr Sam Lamont (Belfast), and David McDonnell (Cork). It was a tricky Fastnet for every boat, and if the weather chips didn’t fall the right way for your boat size and rating, then it was more a matter of how you did against comparable boats. In this, Desert Star did very well indeed, while her performance against other sailing school boats was champion stuff. In the early stages, they made every effort to minimize the effects of adverse tide, playing the big bays of England’s south coast in classic Cork style such that when they got to the Lizard the company they were keeping showed they were doing more than okay. Then outward bound towards the Rock getting through that demanding gap between the big Seven Stones Separation Zone and the Isles of Scilly, they managed to find their way through the shortest route southwest of the zone and north of the islands, then when they came round the Fastnet with the new breeze settled in, the going was good as they got there before it was totally on the nose, while the company all around them was even more encouraging. There was rain on the way to the finish at Plymouth, but it brought a fair wind, and every inch of the way Desert Star was improving on her overall position. They arrived in to find the countdown already under way towards the mighty prize-giving, and for a while the overloaded results computer had them even better placed than expected, but it due course it got itself sorted out and Desert Star was confirmed as winner of the Roger Justice Trophy. Our concluding three photos say it all. We caught up with Ronan this week in Dun Laoghaire, he was back to the grindstone running a five day Yachtmaster course. Except that he doesn’t think it’s a grindstone – he thinks it’s a wonderful thing to be able to do. He’s grateful to be able to do it, and is an inspirational teacher. We’ll be returning to Ronan O Siochru and the Irish Offshore Sailing School in the near future when his season is finally winding down a bit, and he has been able to catch up on sleep. Meanwhile, those of us who had been concerned for the future of Irish sailing generally can sleep a little easier thank to his efforts and idealism. Still can’t quite believe it - the skipper and his trophy in Plymouth, Friday August 21st 2015.